We reviewed eight mainstream budget laptops—because "cheap" doesn't have to mean "awful." Bargain back-to-school laptops exist for a reason: Not everybody can afford a $2,000 laptop. Honestly, most people don't even need a $2,000 laptop. For this set of reviews, we're looking at the other end of the spectrum—basic laptops that let you work and browse without crippling your budget. We asked a number of the biggest PC manufacturers (HP, Lenovo, Acer, Dell and Toshiba) to send over their best laptops costing $500 and lower. There's no need to point out that we're pitting an Atom-based machine against one with a Core i5. This is about price point, not conformity. If we missed your personal favorite in this tier, let us know and we can try to take a look at it. Some people spend more on a single computer than the total cost of these eight budget laptops. 1) If you can spring for a $750 laptop, do so. We took a look at some laptops in that range also, and the difference is palpable. A $500 laptop is all about trading off one important feature for another. You tend to get one standout feature amidst a bunch of compromises. We've found that $750 laptops are generally more well-rounded. 2) On the other hand, you can get a surprisingly competent laptop for $500. These machines aren’t going to make a power user swoon. For basic web browsing, office work, and movie streaming, however, a $500 machine nowadays is a much better proposition than it was ten years ago. The HP Pavilion x360 11T is a slightly smaller 11.6-inch laptop with a touchscreen and an SSD. 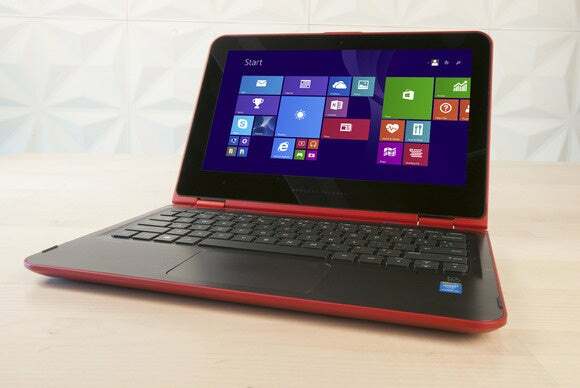 The Acer Aspire Switch 10 E is a hybrid laptop/tablet. The Lenovo S21e is basically a large netbook. There's something for pretty much anyone. The HP Pavilion x360 11t features a Core M and SSD. We also examined what third-party software/bloatware came with each laptop. One way manufacturers push down costs on these low-end machines is by laying out deals with software companies: "We'll put your software on our machine so you get more customers, and in return you subsidize part of the cost of the laptop itself." It's a purely profit-driven practice, and as Lenovo learned last year it can get you in quite a bit of trouble if you're not careful. Another thing to keep in mind: You may or may not be better off buying a refurbished unit if you're in this price range—though that depends on how the previous owner treated the machine. As for methodology, we analyzed these laptops the same way we'd take a look at any other set. Our primary benchmarking tools were PCMark 8 and 3DMark—and yes, we took a look at gaming performance on budget $500 laptops. Spoiler: None of the machines did a particularly great job. Don't buy any of these machines and expect it to run anything more intensive than a 2D indie game or (if you're lucky) something like League of Legends. On low. We also took a look at disk speeds with CrystalDisk Mark—important because some of these laptops are running standard (and slow) mechanical hard drives, while others are packing speedier storage options. 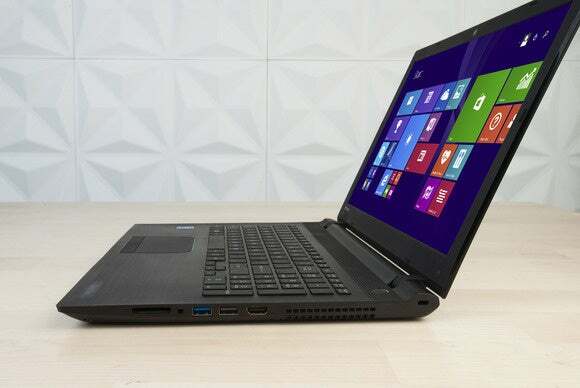 This Toshiba offers a surprising amount of performance for its price. And finally, we did a more specialized test—a Handbrake transcode of a 30GB Master and Commander file down to a 1GB-ish Android Tablet size. That's in addition, of course, to looking at the laptops themselves—the build quality, screen quality, keyboard, and trackpad are just as important as the specs. This is a device you'll most likely use every day, and for a while. Even if you only paid $500, we want to make sure you're getting a machine that feels like a quality laptop, not two sheets of veneered plywood held together with a rusty door hinge. And believe me: It can be done. I've seen it. In fact, let's start with one of the most impressive of the bunch as far as case quality goes—the Dell Inspiron 5000. Dell combines a gorgeous case with decent performance for one of the best all-around laptops under $500. This Lenovo laptop is poised to take on Chromebooks, so at best expect Chromebook-style performance. The Acer Aspire E-15 isn't a bad machine, but it's a bit of an also-ran—there are cheaper machines with better specs and performance.